Soak dry chilies overnight in water, until soft. Remove seeds. Add chilies and rest of the ingredients in blender or food processor. Puree until smooth. Stab chicken with fork to let the marinade soak in. If you're marinating overnight, you won't need to stab it too much. If you're marinating for an hour, stab it all over! Spread marinade over chicken, refrigerate for one hour or up to overnight. After marinating, grill on medium high until temperature reaches 158°. 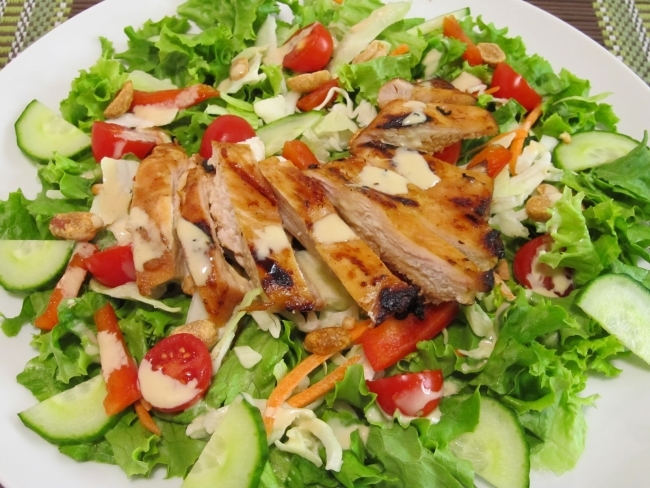 Mix chicken with your favorite assortment of salad toppings (cheese, vegetables, etc.) and the Salad Dressing.